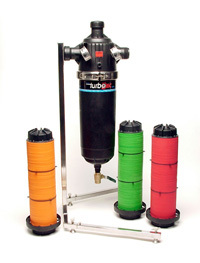 The Turbodisc* system is a fully automatic system designed for side-stream cooling tower applications. It removes sand, silt, dirt, sediment, as well as airborne contaminants like seeds, algae, bugs, and leaves. It has advantages over sand style backwashing systems in that it uses a fraction of the backwash water. Backwashing can be performed in a little as 10seconds using only 3.5 gallons of water when using option air sparging equipment. A minimum of 45 psi is required for backwash. Optional pressure boosting equipment that operates ONLY during backwash is also available. 9) Air-override feature to enhance backwash efficiency. Distributed by Advanced Water Engineering, Inc. Copyright © 2019 · Advanced Water Engineering, Inc.